The information about this bug in Launchpad is automatically pulled daily from the remote bug. This information was last pulled 21 minutes ago. is the slides show up cleanly, without the Master Page styles text showing up. 4) What happens instead is the Master Page styles text shows up on slides (slide 3 screenshot https://launchpadlibrarian.net/66336499/impress.png ). 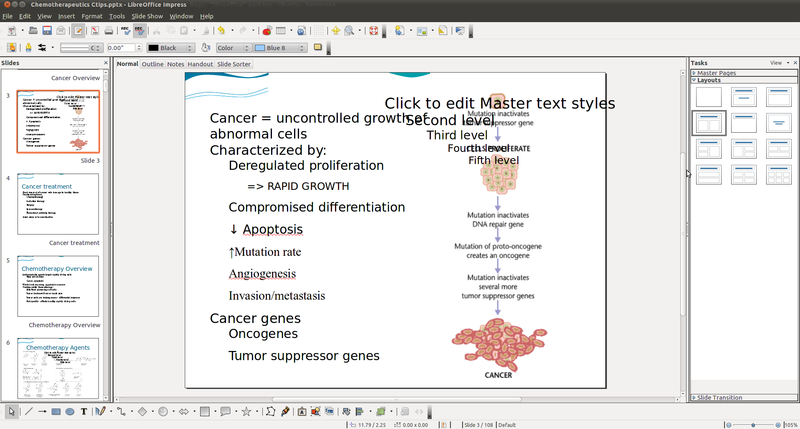 WORKAROUND: Manually delete the text from the slide. Alex Engelmann, thank you for reporting this bug and helping make Ubuntu better. Could you please attach an Impress file that demonstrates this problem? Certainly! Thanks for the fast reply! I've attached my classmates' presentation. It is their work, so use good judgment in how you use/distribute it. By the way, I've had this happen with many but not all presentations. Seems like a likely regression. I can confirm this on 3.3.1 in Natty. Do you know if this is a newly introduced regression since OpenOffice 3.2? No I remember seeing this bug in OpenOffice 3.2 and 3.3 as well, I just didn't submit it because I was under the impression that OpenOffice was barely being developed anymore. * LibreOffice version 3.4.3 000340m1 (build:302) on Windows 7 SP1 64-bit. * LibreOffice version 3.4.3 OOO340m1 (Build:302) on Debian GNU/Linux 6.0.3 64-bit. Also reproducible in Ubuntu 11.10 32-bit, 3.4.4. I just tested this on the 3.5.0 beta2 and the bug is still present. Very sorry about that. Thanks for the docs link. i'm not the only person who has decided that this was a problem from a class mates presentation... Can LibreOffice please fix this bug!!!!! It's really important I have received power point slides for Ancient History from my teacher and they are 40mb! plus!!! i can't convert all of the pptx files as it takes to long with online converters and saving them in microsoft office 2010 on windows as odp is a complete disaster... I am using an unstable development version of libreoffice 3.6 LOdev 3.6.0alpha0+ e9d045f-f8506ca-8a74106-f0d66f on a mac and I even have libreoffice 3.5 on ubuntu. I am also going to report this bug to libreoffice mailing list... it is really important that it gets fixed because everything else in the pptx file works really except this annoying bug!!!! these powerpoints have more than 40 slides!!!!! can some help ressolve this issue???? instead of deleting the text one by one on all the slides... i tried saving these on mac office 2011, as a ppt file and it just crashed!!!1? If a fix is released in a daily version unstable release of libreoffice on one of the mirrors even if its windows mac or linux.. i can access that version and save those slides as an odp so that it works really well with libreoffice 3.5.. on my ubuntu desktop as an odp file!!! Do not understand how to fix bugs. As am not good at coding only good at identifying and solving without coding. But I found another work around also. In office 2011 for Mac of you select all of your slides by clicking on a slide and then using the keyboard shortcut (command a)that will select all the slides. If you click layout under the home button ribbon. And select blank. It changes the master slide layouts. That is what worked for me. Then you can open it as a pptx file in impress. Something isn't working to well with layouts in Libreoffice I suspect. I cannot assign myself as I cannot code. Rodo, you worked in that area - can you have a look please? i can attach it to a dropbox link that can be retrieved without signing in. the blank slides which are blank etc slide 12 have txt in them, they are normal slides don' t worry about them. I just have to change font colour. the only problem is the master slide one. im student who has received this presentation. I think they were old and converted automatically to pptx from an old office version. probably microsoft office 2003-2010. I cannot get ppt version. just realized dropbox converted the file to suite there needs including changing fonts and stuff, the power point looks really good now. ill have to upload original file to ubuntu one. > i can attach it to a dropbox link that can be retrieved without signing in. > problem is the master slide one. > office 2003-2010. I cannot get ppt version. > changing fonts and stuff, the power point looks really good now. > ill have to upload original file to ubuntu one. > > i can attach it to a dropbox link that can be retrieved without signing in. > > problem is the master slide one. > > office 2003-2010. I cannot get ppt version. > > changing fonts and stuff, the power point looks really good now. > > but any way. > > ill have to upload original file to ubuntu one. So, mark as FIXED, it will be (at least) available in LibreOffice 3.6. Checked with daily build Win-x86@6-fast, pull time 2012-05-08 21.43.52, Build ID: 7f3f6e4, with the file in comment 1 and it doesn't have the text above the images. REFERS TO ATTACHMENTS AS WELL. Windows 8 Consumer Preview 64 bit... libreoffice works very well even in windows 8. Problem is still happening on some slides but not all. such as the 1st slide of my presentation does not have this problem or the 7th slide which is attached, but then the second slide does (attached). it is now only on slides 2,9,18 out of 30 slides in this presentation. and it still occurs on some other presentations which are .pptx that I have but not on all the slides. > it is now only on slides 2,9,18 out of 30 slides in this presentation. Could you please attach the pptx file here? ljelly, this bug is VERIFIED FIXED for the attachment noted in https://bugs.freedesktop.org/show_bug.cgi?id=35372#c1 . If you are having a problem in LibreOffice, please file a new bug. If there are problems left please open a new Bug report. i have filed a new bug and i will post my attachment noted there. It has the same issues as this bug. i'm sorry for this to be a problem. i just thought that if i posted in this bug report as well, it might solve the problem for other pptx files as well, not just the one attached. > problem in LibreOffice, please file a new bug.